Tina Hopgood is dissatisfied with her life. As a school child her class had corresponded with Professor Glob at the Silkeborg museum in Denmark about the discovery of the Tollund Man, an Iron Age man found perfectly preserved in a Danish bog. She is now the wrong side of 60 years old and writes once again to Professor Glob. Unfortunately he has passed away, but Tina receives a reply from the present curator of the museum, Anders Larson. What starts out as a quite formal exchange of letters about the Tollund Man and his effect on modern life, soon turns into a more personal correspondence. Two very different characters; Tina, a disillusioned hard-working farmer’s wife from East Anglia and Anders, a widower and the curator of the Silkeborg museum in Denmark. They both find they have common ground in feeling somewhat surplus to their own lives. Tina is a cog in the efficinet working of the farm, but feels her family wouldn’t notice her otherwise. Anders, a widower, lives alone. Always looking back to the life he lived with his wife and wondering if he had done enough to help her. This book is gentle, thoughtful and tender. The relationship grows slowly, like the opening of a fern frond. As they discuss their lives they develop a closeness with each other that neither seems able to find with their own families. When there is upheaval in Tina’s life she has to re-evaluate their relationship. Whether that means ending it or setting it on a new pathway only she can decide. A beautiful debut with gorgeous prose. I totally loved both characters and the slow, thoughtful response to each other’s letters. I was quite ridiculously peeved at the thought of them using email rather than real letters, I loved the idea of their handwritten letters dropping through the letter box and the feel and touch of the paper and envelopes. I did guess quite early on what was going to happen, but it in no way impaired my enjoyment of the book. I felt the author played out the events perfectly…or her characters did. A book about lost lives, missed opportunities and the fact that it’s never too late to change your life. A wonderful read and highly recommended. 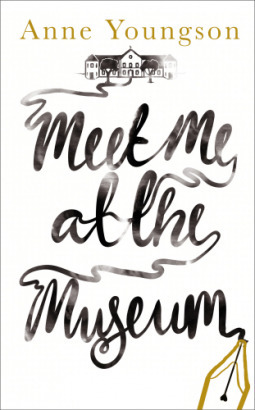 Anne Youngson will be appearing at urmston bookshop on Wednesday 6th june 2018, to talk about her book and her writing journey. Tickets are £3 inc glass of wine and redeemable aginst the cost of a book. 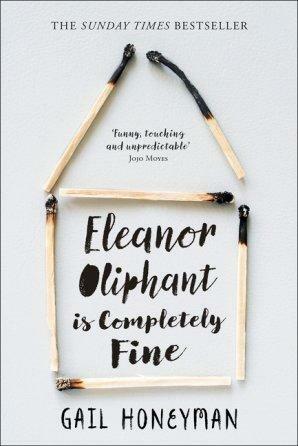 Eleanor Oliphant is Completely Fine…but not really. her life consists of work – Monday to Friday, with very little in the way of human interaction. Then weekends spent at home, alone, not speaking to a soul from leaving work on the Friday to getting on the bus on Monday morning. On Friday after leaving work she buys a pizza from Tesco and two bottles of vodka that she drinks throughout the weekend, never getting drunk but in a suitable haze to see her through. 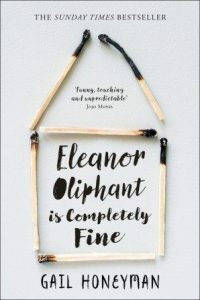 Eleanor’s social skills are extremely limited; she has no filter for her thoughts and her only point of reference is ‘mummy’ who is cruel and vindictive and no longer in her life except for a weekly phone call. The first she decides is the man for her: the one she will walk off into the sunset with. So she sets about updating her appearance for the meeting that will change her life, with hilarious consequences. The second man is Raymond, the IT man at work. They meet when Eleanor’s computer breaks down. Raymond is one of the few people who is not put off by Eleanor’s blunt manner. The third man is Sammy. When Sammy is taken ill, Eleanor and Raymond help him and the three become friends, resulting in Eleanor’s life opening up and a huge learning curve. Eleanor is one of the most fabulous creations. Her thoughts on other people and the world around her are totally hilarious. But at the same time she is vulnerable and holds dark secrets from the past. We follow her as she tries to come to terms with who she is and how she interacts with the world, with the help of the lovely Raymond. Their relationship is a joy to behold. His small kindnesses making all the difference to a woman who has never been shown any and known only loneliness. This is such a powerful book, having strong themes of loneliness and heartbreaking sadness but with a huge warmth and tenderness. You’ll laugh out loud on one page and cry buckets on the next. I didn’t want this book to end and was bereft when I had to say goodbye. Do not miss it. The best book of the year so far. The book is set in Partageuse, South West Australia. 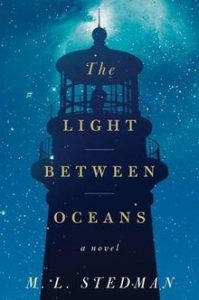 Tom Sherbourne, just home from the First World War takes a job as a lighthouse keeper on Janus Rock to counteract the effects of war; needing the silence and nature to soothe his troubled mind. The island is miles off the coast of Partageuse and the store boat only visits every three months, the lighthouse keeper is granted a month’s leave every three years. Tom is meticulous in carrying out his duties and is principled and disciplined. I loved Tom’s character, his quiet dignity and diligence, the love he felt for his wife. A good man put in a terrible position. Whilst on leave in Partageuse, Tom meets Izzy, the two fall in love and move back to Janus to start married life together. Izzy’s greatest wish is to have a child and when she suffers two miscarriages and then a stillbirth, she is heartbroken. The crux of the story comes into being when a boat is washed up with a dead man and a baby inside. Against every moral fibre of his being, Tom is convinced by Izzy to let her keep the baby. You know this is not going to end well. The descriptions of the island and the lighthouse with the weather and the sense of isolation are just wonderful, so evocative that it has you yearning for life on Janus. The genius of this book is making all the characters real, normal, flawed individuals who are ultimately good people with such tragic life stories that you really feel for them and understand the decisions made…until you meet the person who has been affected by that decision, who is also a good person who life hasn’t treated at all well. The layers keep peeling away like onion skins and you are forced to confront your own moral standpoint. The author has created the ultimate moral dilemma and this book is deeply, deeply affecting and so emotional, it had me sobbing through parts of it. The story covers all sorts of emotions; love, guilt, grief, morality, remorse, but with such a deft hand that although it is heart rending, it is also beautiful and immensely readable. Unbelievable that this is a debut novel. I cannot recommend this book highly enough and as it is going to be released as a film in the autumn now is the perfect time to read it.